Free delivery by 26th May, if you need it sooner, select express at checkout for delivery by 12th May. Grey two-piece, slim-fit tuxedo with black satin detailing to the lapel, pockets and buttons. Complete the look with a pure cotton, white tuxedo shirt with pleats and black studs. This suit is made from 100% wool, ethically-sourced from Australia. The wool is medium-weight, keeping you cool in the summer and warm in the winter. This suit can also be made from a slightly lighter weight cotton - just let us know if that's what you would prefer! Our suits undergo the highest standard of workmanship, with double stitched lining, hand-stiched lapels, and reinforced buttons - culminating in a 30-step pressing process which leaves your suit fitting perfectly. Every item is made-to-order, to your exact measurements and preferred fit. Got a photo of something you like the look of? If you can't find the right stye in the gallery, but you have something else in mind, just send us your style images over our instant chat and we'll take it from there. Free World-Wide Delivery Within 5 Weeks. Once you have submitted your measurements, your suit will be delivered within 5 weeks. Receive your order in 3 weeks for an additional £50. After you complete your order, we will ask you to upload your measurements in your account here. You can view our measurements guide + videos to help you get those measurements spot on, and all measurements will be checked over by an experienced stylist. If you need a bit of extra help, you will have the option to book in for a free fitting in our offices after purchase! In your purchase confirmation email will be a link to our available appointment times. The Drop will go to great lengths to ensure your suit fits you perfectly. With a three-step process of measurements (you can view our video guide here), photos, and a manual check of measurements by one of our stylists, we are confident the fit will be spot-on, but if there is anything that needs changing we will reimburse up to £35 of alterations (only 1 in 10 people take us up on this). We understand that everyone's perfect fit is personal, so let us know if you have any specific requests! Our key customisations are lining, embroidery (up to 2 lines on the inside of the suit jacket), and buttons, but absolutely anything you like about the suit is customisable and we can accommodate almost any request - feel free to send across a specification if you've been dreaming about that suit with exactly 4.5inch lapels! We combine the best of artificial intelligence and hand craft in order to guarantee you the perfect outfit, just the way you want it. 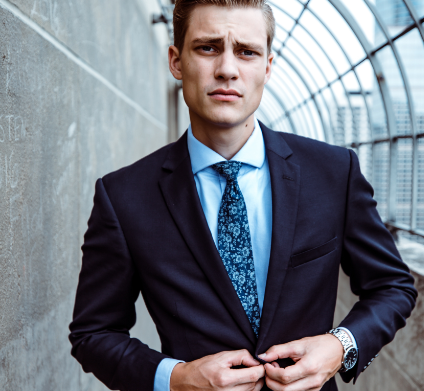 It will fit your body based on the measurements you send us, however if you would like to make any adjustments, we would be happy to reimburse you up to £35 of the alterations which can be carried out at your nearest tailor. We'll even help you find one close by. We're so good at getting the fit perfect first time, that less than 1 in 10 customers take us up on this. All orders include free worldwide delivery within three weeks so rest assured your order will arrive on time. We make each suit to your exact measurements, with the fit that suits your style. Read more about our Perfect Fit Guarantee. Couldn't find your style in our gallery? Send us an image of what you're looking for and we can make it for you. Copyright © 2019 The Drop Technology LTD. All rights reserved.